Gerald Barnett’s new book about legendary broadcaster Leo Fowler brings Gisborne’s 20th Century cultural history to life. 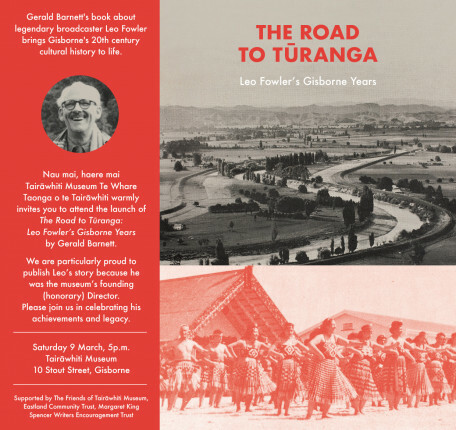 Join us at Tairāwhiti Museum for the launch of ‘The Road to Tūranga: Leo Fowler’s Gisborne Years’ by Gerald Barnett. We are particularly proud to publish Leo’s story because he was the museum’s founding (honorary) Director. Please join us in celebrating his achievements and legacy.